Borussia Dortmund and England sensation Jadon Sancho has scored two goals for Lucien Favre’s side against Mainz, in the space of just seven minutes. 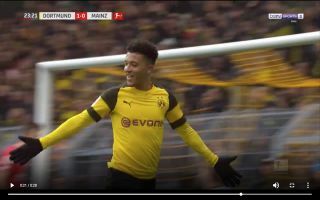 Sancho opened the scoring for the Bundesliga giants in the 17th minute of the clash, the England international tapped the ball into the back of the net at the far post after a brilliant cross from playmaker Mario Gotze. Sancho got his second of the game, just seven minutes later, the star was once again at the right place at the right time after he slotted Thomas Delaney’s cross into the back of the net. Sancho scored 10 times for Lucien Favre’s side this season, the former Manchester City youngster has also showed his eye for a pass by laying on 13 assists to his teammates. Jadon Sancho hits double figures for the season ? Sancho is one of the brightest talents to emerge in England years, given his amazing performances since moving to Germany – there’s no doubt that a big club could come calling for the 19-year-old’s signature very soon.